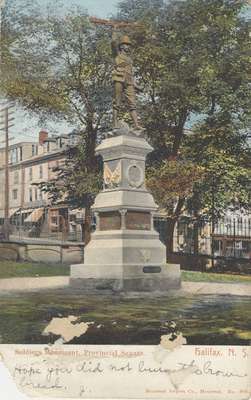 Soldiers Monument, Provincial Square, Halifax, N.S. A postcard sent to The Reverend Robby Layton in New Aberdeen, Cape Breton, from Halifax. This monument was dedicated to the men of Halifax and Nova Scotia who fought in the Boer War. Front: Hope you did not burn the brown bread. J.